The St. Mark’s Youth Choir is comprised of Boys & Girls (Ages 7-18: Boys of unchanged voice). 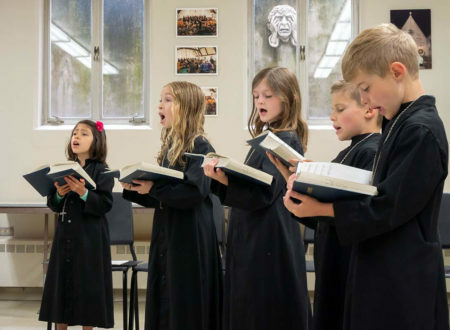 The Voices for Life curriculum, affiliated with the Royal School of Church Music (RSCM) provides an exceptional educational opportunity to each chorister covering music theory, solfège/sight-reading, basic vocal technique, and music and church history. This training program is one of the few of its kind in our community and introduces young singers to a world of great church music sung in liturgical context. Extraordinary musical skill or musical background is not a prerequisite to participate in this program; an ability to match pitch, follow directions, and a willingness to work together in a team setting are desired attributes of a successful candidate. Does my child need prior musical experience? All children regardless of musical background are encouraged to participate, though prior musical experience is helpful. What is the musical curriculum? This program follows the general outline of the Voices for Life curriculum as set forth by the Royal School of Church Music. This curriculum emphasizes general musicianship which includes music theory, aural skills, general instruction in sight-reading, basic vocal technique, group teamwork and discipline, and the ongoing work of refining their individual voices as soloists and ensemble singers. What other guiding principles are the children taught? Instruction occurs in the broad, accepting, and nurturing environment of the Episcopal Church, which is committed to respecting the dignity of all people. Do you have to be a member of the Episcopal Church to participate? No. Children ages 8-16, regardless of faith background, are encouraged to participate. Music if for everyone. All rehearsals and singing sessions are led by the Director of Music with help from volunteer music staff. Music education is a serious commitment. Rehearsals take place every Wednesday from 4:00-6:00 pm depending on your child’s age. Choristers sing at a Sunday morning choral service about once a month. A high level of attendance is vital and prioritized. Through the generosity of our congregation, Friends of Music, and grants, our entire Chorister program is free to any who join.